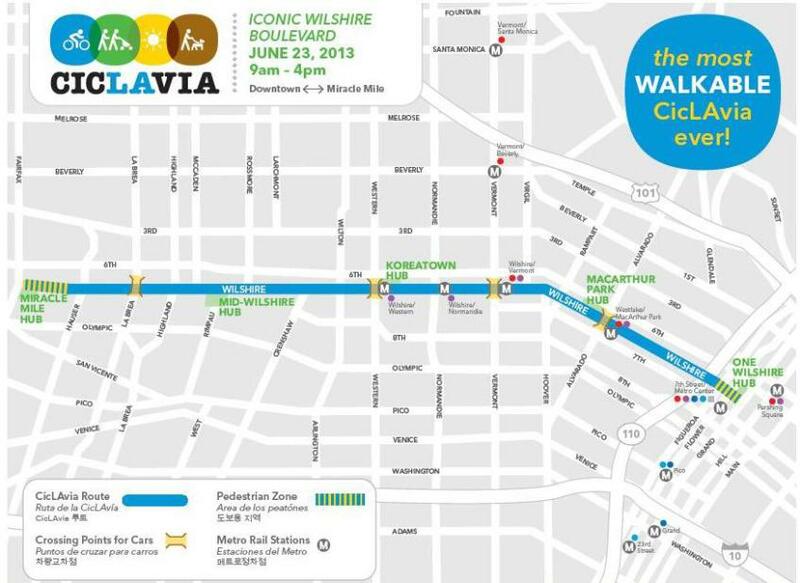 I’m guessing most of you are already fully aware that CicLAvia is coming to Wilshire Boulevard on Sunday from 9 a.m. to 4 p.m. between downtown L.A. and Fairfax Avenue along the Miracle Mile. Wilshire will be closed to car traffic and turned over to cyclists and pedestrians. I’m guessing there will be many, many thousands of them! If you’re at the event, please swing by Metro’s booth — look for it near the La Brea Tar Pits. There will be plenty of information about Metro’s current bus and rail offerings as well as the Purple Line Extension project which will take the subway from its current terminus at Wilshire/Western for 3.9 miles to Wilshire/La Cienega Boulevard. The CicLAvia route conveniently covers a healthy chunkage of the subway’s route. Woot woot! (Tons more information on the CicLAvia website, too). Speaking of Metro Rail and the subway, it’s a pretty good way to reach CicLAvia — there are four Red or Purple Line subway stations along or very close to Wilshire (7th/Metro Center, Westlake/MacArthur Park, Wilshire/Normandie, Wilshire Western) and both the Blue Line and Expo Line also serve 7th/Metro Center. More information about the event is after the jump, including bus detours and more information about Metro Rail schedules on Sunday. Bus lines detouring for the event include: 20, 60, 206, 210, 460, 487, 720 and Metro Silver Line. Detours will be in effect from 9 a.m. to 5 p.m. or when barricades are present. For more details, please check the Service Advisories page. Wolfpack Hustle is also holding a bike race around City Hall on the same day until approximately 9 p.m. that will impact bus service on Spring Street, Main Street, Temple and 1st Street. To avoid bus delays and detours, use Metro Rail to travel through and around impacted areas. Red and Purple Line will each run every 10 minutes with 6-car trains. This means a combined service of every 5 minutes between Union Station and Wilshire/Vermont. Gold Line will run every 7-8 minutes with mostly 3-car trains. Blue and Expo Line will run every 12 minutes with 3-car trains. Green Line will run every 15 minutes with 2-car trains. Expect limited bike rack availability on the Orange Line. Use adjacent bike path where available. Anticipated stations to be busiest include Union Station, 7th St/Metro, Wilshire/Vermont and Wilshire/Western. Consider using other nearby stations along the route to avoid potential wait times. Use entire platform length when boarding for more seating and bike space availability. Board with bikes using doors marked with yellow decals. Always walk your bike within Metro stations or on board trains. Do not use emergency exit gates to enter or exit except during emergencies or unless directed by law enforcement or Metro personnel. The Purple Line connects at 7th/Metro with the Red, Blue and Expo Line. Bicyclists who want to get to CicLAvia by Metro should review Metro’s bike rules. For those of you riding bikes from Union Station to Wilshire, here’s a downtown Los Angeles bike map. The gist of it: there are north-south bike lanes on Spring Street and then you can pick your way west toward Wilshire on 5th (one way going west), 7th (traffic in both directions) or 8th (one way west). Be safe! The Iconic Wilshire Boulevard route will connect One Wilshire in downtown Los Angeles to Fairfax Avenue along Miracle Mile. These two anchor hubs will feature pedestrian zones with performers, activities, food trucks and more. Additional hubs along the route include MacArthur Park, Koreatown and Mid-Wilshire. Have your TAP card handy and save 15% on CicLAvia T-shirts at the hubs along the route. I saw this today! 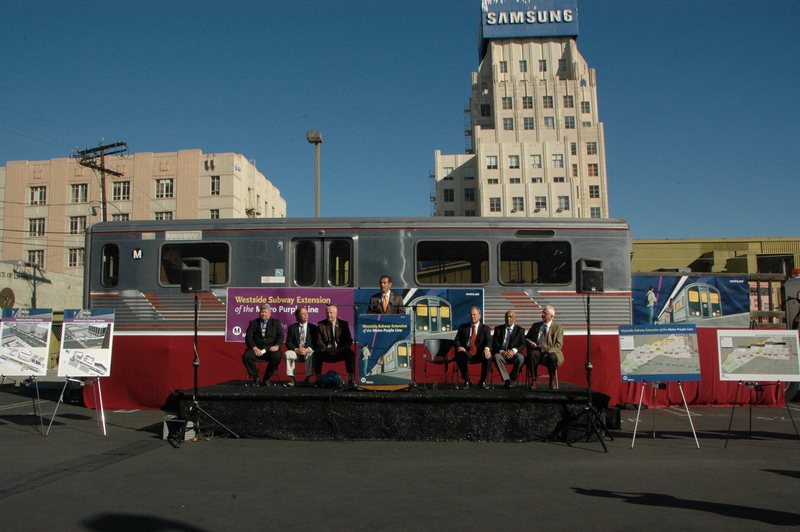 Was the mock car eve a part of train car that actually ran on the red/ purple line? It was good to raise awareness about the purple line extension. I don’t think it was ever a functioning train car, but I do know it was once used as a prop in a Ridley-Scott movie!